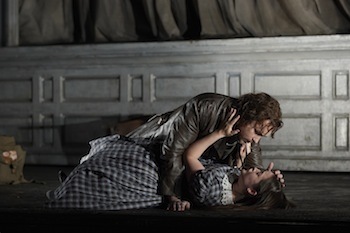 The Canadian Opera Company is opening it’s Spring season with Donizetti’s Lucia di Lammermoor; a dark tale of forbidden love, deceit and mental illness with the brooding atmosphere of an Emily Brontë novel but set to a lush, beautifully sung Italian score. Lucia di Lammermoor is considered a bel canto masterpiece (literally translated to “beautiful singing,” bel canto is a highly stylized and ornamented method of signing). Donizetti was the contemporary of Rossini and Bellini, the music is ornate and distinctly Italian-sounding which in this case makes for an interesting juxtaposition for a story set in a foreboding, early Victorian-era Scotland. Based on the novel The Bride of Lammermoor by Sir Walter Scott, the opera is the story of Lucia, a recently-orphaned girl still mourning the death of her mother. Lucia falls in love with Edgardo, a man from a rival clan. When Lucia’s power-hungry brother Enrico discovers the secret love affair, he forces Lucia to betray her lover and marries her off to a wealthy lord. The act of betraying her lover eventually drives Lucia insane and leads to tragic consequences. Director David Alden’s interpretation of the opera hinges on Lucia’s madness. He sets the opera in what looks like a decaying Victorian-era sanitarium or insane asylum. Alden’s staging hints that the entire opera could in fact be Lucia’s delusional fantasy. Alden uses the show-within-a-show conceit to achieve this effect. Lucia first appears on a smaller proscenium stage that forms part of the set, in one pivotal scene the chorus is seated on stage and forms an “audience” for Lucia’s show and at different times throughout the production scaffolding holding up set pieces is revealed to suggest a “backstage” view. I thought setting the opera inside the off-kilter world of Lucia’s brooding, fractured mind was an effective and well-executed device that really underlined the tragedy and pathos of the character. Speaking of the main character, let’s take a moment to talk about soprano Anna Christy in the lead role of Lucia. Simply put, she is stunning and delivers a pitch-perfect Lucia. The slight, girlish soprano is often picked up and tossed around like a rag doll by the men in Lucia’s life. Christy is spellbinding, perfectly channeling both Lucia’s innocent naïvete and her terrifying, seething intensity during the famous mad scene. Her expressive coloratura is the vocal highlight of the performance. Christy’s voice pairs beautifully in duets with Stephen Costello’s bright, youthful tenor. As Lucia’s lover Edgardo, Costello brings a fiery passion to the character and especially shines in Edgardo’s heartbreaking aria in Act III. Baritone Brian Mulligan is superbly cast as Lucia’s conniving brother Enrico. Mulligan is especially effective in the duet between Enrico and Lucia in Act II. The power he lords over Lucia manifests itself in a near-incestuous level of physicality that makes the scene uncomfortable to watch. Another curious but fascinating musical highlight of the opera is the inclusion of the glass armonica. The rare instrument was originally part of Donizetti’s score but the composer later re-arranged the part for the flute instead. Used during Lucia’s mad scene, the instrument has an ethereal almost electronic sound that adds to the creepy atmosphere of the scene. With its deliciously dark, brooding, atmosphere combined with Donizetti’s lush score Lucia di Lammermoor is superb. It’s worth seeing for Anna Christy’s spectacular performance alone but David Alden’s thoughtful direction really takes the production to the next level. This is not a Benjamin Franklin armonica, it is a modern-design variant named the Quartz Harmonica, a 20th century new invention, by Gerhard Finkenbeiner. That new design incorporates ‘fused silica’ (a type of glass developed for scientific work in the early part of the 20th c.) as the essential component within the Finkenbeiner patent description together with multiple claims of his presumptively necessary design improvements towards mechanized glass music instrument design for this ‘new’ musical instrument (with nary a single mention of Benjamin Franklin as the originating precedent armonica inventor – see US Pat. 4,589,322). Unfortunately in the initial sales and vast commercial media publicity (now abandoned), the late Finkenbeiner in marketing represented that his instrument was a reproduction of Franklin’s armonica invention. A clever scientific glass technician and imaginative amateur musician, Gerhard readily admitted in conversation originally seeking what became a highly profitable way to manipulate what were the usually discarded ends of the General Electric produced commercial grade quartz glass tubing remaining from his extensive lab device glass commissions and military weapon gyroscope production carried out at first under the guise of historical music instrument reproduction.